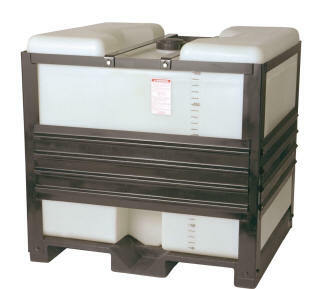 Our pallet tanks are free standing and designed for light-duty transport of fluids and solids. The metal frame base of the pallet Tank is designed for forklift compatibility. 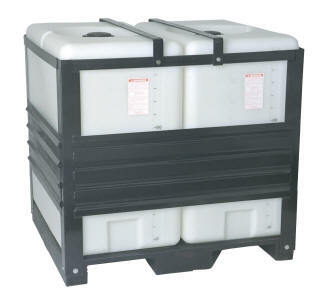 Vertical pallet tanks have polypropylene bases. All pallet tanks are manufactured from medium to high density polyethylene and are standard in translucent "natural" color to enable you to determine the fill level. These horizontal tanks are fabricated from an FDA compliant polyethylene material and are suitable for storage of potable water and both food and pharmaceutical ingredients. 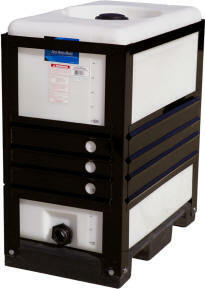 All horizontal tanks are marked with gallon indicators and have a bulkhead fitting. Please fill-out our Pallet Tank Inquiry Form to receive additional information such as dimensional drawings and pricing.